Thursday, June 4, 2015 - It is not always easy to see the insidious and incremental results of using new bio-technological advances in agriculture. However, the effects become clearer when the results of that technology are removed. Case in point, there is currently a lot of controversy regarding the effect of GMO crops and glyphosate herbicides on animal health. Many livestock producers have, in a sense, consulted the ultimate experts – their livestock – to resolve the dispute. They did this by removing glyphosate contaminated GMO feeds from their livestock rations. An Iowa hog producer who switched from feeding his animals GM feed to non-GMO feed found that drug treatments for sicknesses were cut in half. 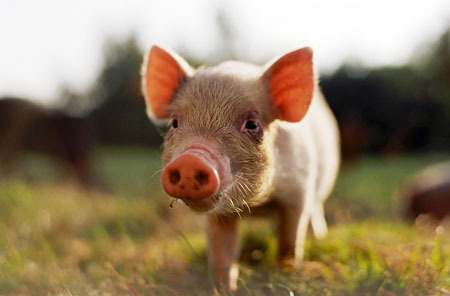 Sow conception rates increased from percentages in the 80s to 90s, and the size of hog litters increased. A neighbor reported that switching to non-GMO lowered input costs. The seed is much cheaper, about $150-$160 per bag, while GM seed can cost $300 per bag. A Minnesota grain farmer and beef producer grows 1400 acres of non-GMO corn, most of which he uses for feed. He claims his yields were equal to or better than that of his neighbor’s tainted GMO crops. He also found that feeding non-GMOs cut cattle deaths from digestive problems or pneumonia in half, from 1.2% of his herd to 0.6%. A South Dakota farmer opined that his livestock seemed more content and saw 5% reduction in feed use when he switched to non-GMO feed. Even in the areas where CAFO poultry facilities were suffering from severe outbreaks of avian influenza, many small, organic (GMO free) poultry flocks were free of symptoms even though they had blood titers against the disease. Unfortunately, these flocks were also destroyed in the mass hysteria that condones the eradication of animals that are naturally immune or resistant to the disease. Wary of the strong-arm techniques the bio-tech industry uses to quell and discouraging views, many farmers are reticent to talk about their non-GMO production. Animals are under no such restraints and will choose healthy feedstuffs over GM crops whenever given the choice. They are the experts.